Wonderful night at YL Residence, created and delivered by BLISS events team. An ultimate event to be remembered! YL Residence is a perfect place to capture the precious moments of any kind of event. Thanks to Destination Asia for giving an opportunity to BLISS events team to design and turn the ideas to be truely remarkable memory for everyone. Creativity is our core value and that drive us to be professional events organiser. www.blisseventthailand.com for more information about events and wedding at YL Residence. We met the couple few months before the wedding date at Conrad Koh Samui. At first sight, we could not really imagine how Iranian wedding would be because this is our first time of the new experience. The planning process had run like clockwork with the numberous emails correspondance, many different designs, floral mock up and in the details attention, finally the big day arrived! Knowing that they wanted a casual reception venue with touch of elegant decor and there is no whereelse wonderful like the private beachfront of Conrad Koh Samui. 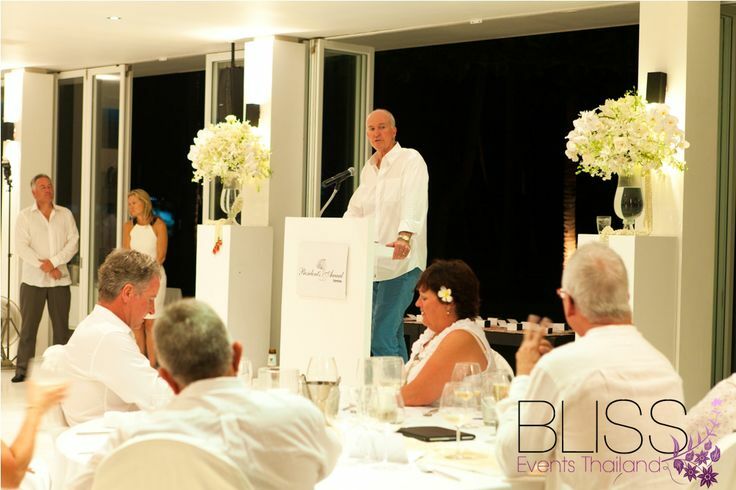 The tradition ceremony was held at the magical sunset lougne with the spectacular ocean view as the backdrop until the sunset. Then we escorted them to the beach where we set up the magical wedding reception. The evening program was started with the trio band, locale fire dance and surprisingly massive fireworks at the end. It was 3 days program destination wedding with a lot of preparation and attention to details. We are so glad that finally we received a big reward with wonderful feedback from the couple, click below to review the testimonial. Authentic Thai : destination wedding in Thailand. 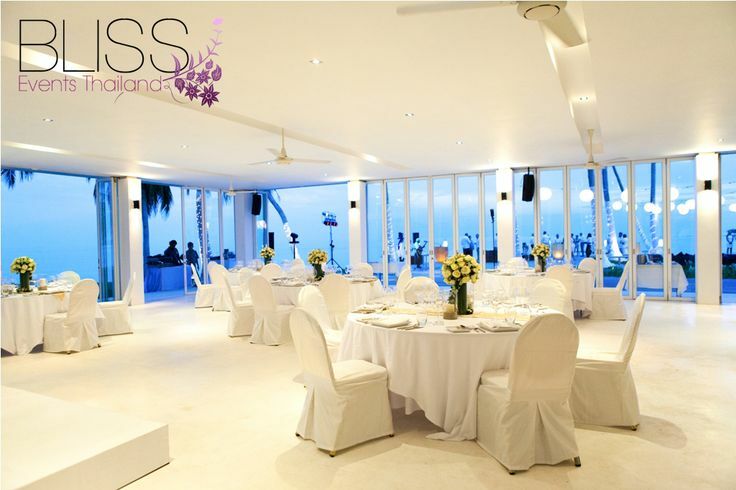 The beautiful backdrop of a blue ocean in Koh Samui is where you can chose to be your destination wedding in Thailand. Groom started the ceremony as he was introduced by a long drum parade, he then crossed two gates called the “silver gate” and “gold gate” in order to meet with bride on the wedding day. The parade is consisted of traditional Khan Mak (7 sets of fruit, Thai desserts and religious equipment) as Thai people believe in bringing prosperity to the newly married couple. Thai wedding ceremony is an unique ceremony which family and friends are able to engage with the couple and most importantly the serenity, intimate and touching experience. 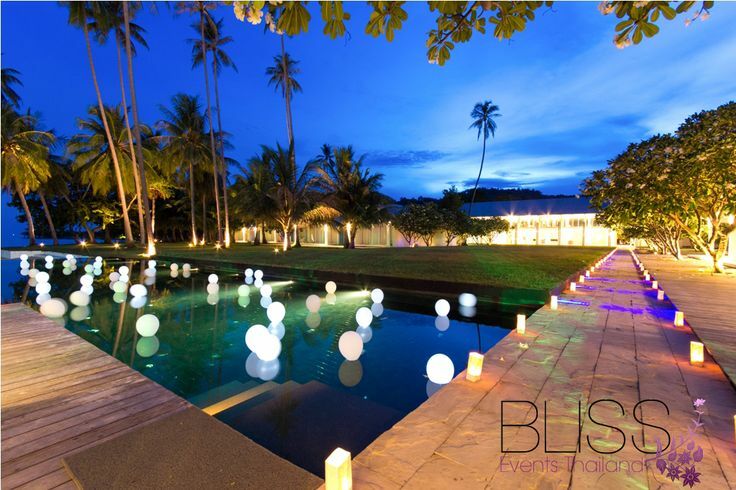 BLISS events & wedding is able to deliver the authentic Thai wedding experience in Koh Samui and Phuket. Our Thai style wedding will be truly unique which we bring the real locale to our guests because this is your destination wedding, so you will get the real experience. Our professional consultant knows how to organize your important event, please click here and receive full details and pricing. Experience is something you can not compare with the other and you can create with your own dream.Congratulation to Wendy & Ho, the wedding couple from China. Small wedding celebration with in family and the closed friends for 40 people at Koh Samui. Wedding day is started with the tea ceremony inside the villa, the unique wedding ceremony on the glass stage and wedding reception inside the villa. It is a kind of wedding experience at home. Luxury table setting for Wendy & Ho at Upni Duniya Villa.We have recently imported the golden beaded charger plates to make our guests to get more luxury experience whenever getting marriage with Bliss Events & Weddings team.